Residents of Rotorua are not one to boast, but we did manage to bring Hollywood glamour to a certain central North Island Spa town back in the 1930s. And despite closing for a time in the 1980s and 1990s, the Blue Baths has survived, still providing fun for families as well as a place to host stylish work dos, weddings, and special events. 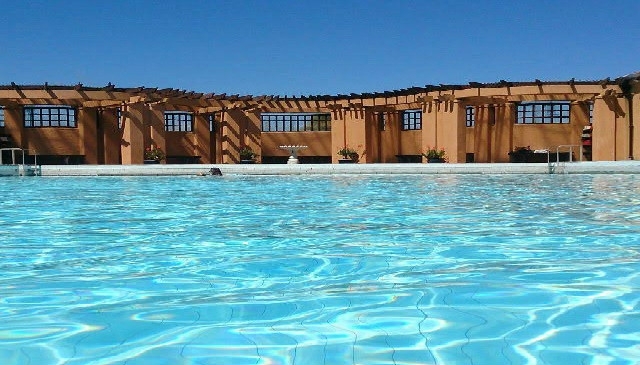 Opened in 1931, a Spanish-styled building, set in the scenic (if rather uninspiringly named) Government Gardens, housed the two pools which made up the Blue Baths. The Baths was unique for its time by allowing men and women to bathe together in public. While it was a place where families could swim together, there was a certain degree of segregation between adults, teenagers, and smaller children. Children were mainly only allowed to swim in the smaller, heated Juvenile pool, with trellis partitions separating them from swimmers in “the Big Pool” - the cooler, much deeper, diving pool. 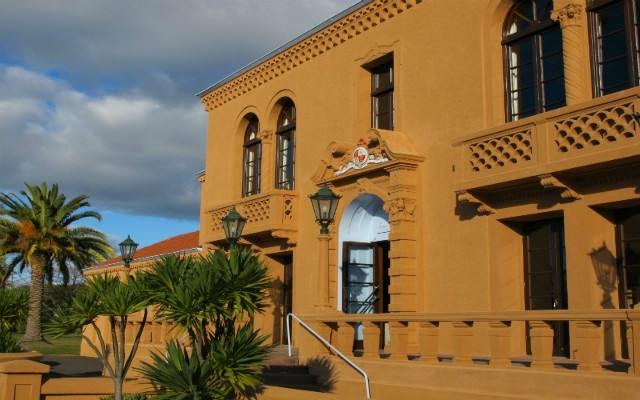 While the second floor Tea room was not “strictly” the sole province of men, it was still a place where women and children were discouraged from visiting. For those who grew up in Rotorua during the sixties and seventies, the Blue Baths was really the only place to go for a public swim. Yes, the Aquatic Centre arrived during the 1970s, but initially it only had the large Olympic pool, targeted for use by serious swimmers. The Polynesian Pools (now known as Polynesian Spa) was nothing like the complex it is now and was primarily for soaking sore muscles, and relaxing. Of course, you could always drive out to one of the many lakes in Rotorua. But Blue Lake, the closest to the city, didn’t have a hot / cold water option. The next closest lake, Tarawera, does have Hot Water Beach, but this was and still is only accessible after either a boat ride across the lake or a long trek through the bush. Both these and the other lakes in the area offer fantastic natural scenic beauty which in itself is worth the trip, and a trip to any lake offers more than just the chance for a refreshing dip. But for those who couldn’t take the trip, or who preferred to be in a more supervised environment, there really only was just the Blue Baths. 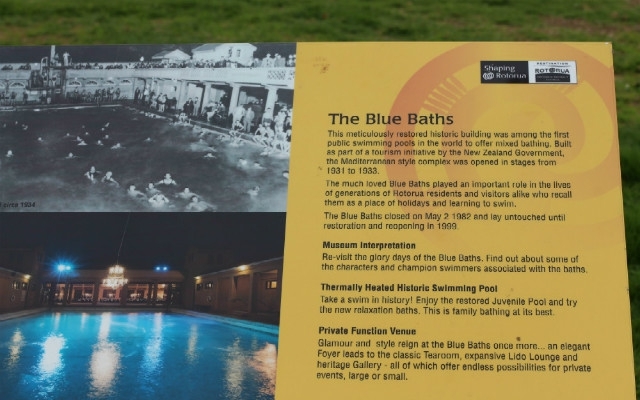 Sadly, the Blue Baths closed in 1982. However nothing keeps a good spot down, and in 1999, it was back. Not bigger (as the diving pool is now filled in, to form the floor of the Lido Lounge) but certainly brighter and better than ever before. Both The Tearoom and the Lido Lounge cater for special events, theme nights, cabarets, weddings, and Christmas functions. Musicians and entertainers are available for hire. It really doesn’t matter if it’s a seventies night, the Rocky Horror Picture Show, a comedy gala, or a kids’ themed show, the Blue Baths provides the venue, the entertainment, and whatever atmosphere the guests require. One thing the Baths has never lost, and that is its glamour and style. If you prefer to use other venues around town for your special events, but still want to enjoy the fine catering on offer, the Baths will send you to your preferred venue with the perfect packed meal. And for those who still want to use the Blue Baths for its original purpose, there’s still somewhere to swim. Heated, with two soaking pools to the side, the Juvenile Pool is a great place to play, especially for the younger children. The Blue Baths tends to be quieter than the neighbouring Polynesian Spa, so there’s plenty of room for children to spread out. Shallow enough at one end for the three or four year old to negotiate, while at the other end the older kids can play in deeper waters, and with the adult able to supervise from the comfort of one of the soaking pools, the Juvenile Pool suits all family members. And on the way out don’t forget to check out the wringer, a relic from when the Baths were first built, and quick drying lycra togs were not the norm. 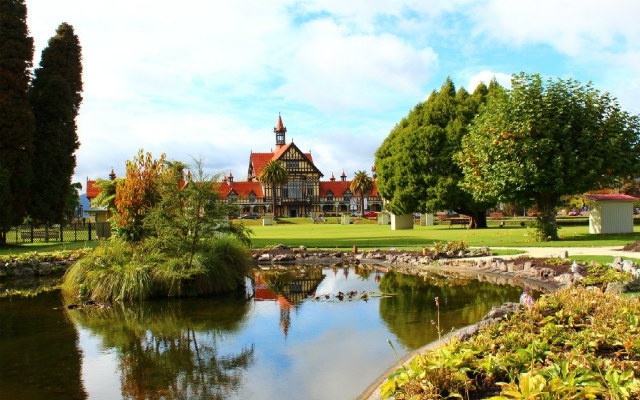 Government Gardens, where the Baths are located, has picnic and play areas, as does nearby Lake Rotorua. If you prefer going further afield, take your lunch / afternoon tea / picnic dinner out to the Redwoods, or one of the other lakes in the Rotorua area. It’s not like there’s a shortage of lakes to choose from (about 15). Opening hours for swimmers are 10am to 6pm, and it does pay to call ahead, in case the complex is being hired out for one of those special functions. If you’re lucky you may get to listen to rehearsals for those concerts, or just some jazz and swing music in the background.